“May God who has begun this good work in you bring it to completion.” These words during the diaconate and priestly ordination touch an essential point in every young man’s call to the priesthood: the personal action of God in that person’s life. I did not want to be a priest. I did not look for it, and I did not embrace it with open arms at first. For most of my life, I only wanted to earn lots of money, find a great girl, be famous, and live life to the full. Sounds good does it not? I thought so too! For me, the idea of being a priest was the exact opposite of all these things. I can now say as a priest, however, that the priesthood is the greatest gift a man can receive in this life. The happiness and fulfillment that I now have as a priest in the Legionaries of Christ is much greater than what I previously experienced: it is a whole other level. In my vocation story, Jesus Christ acted directly in my life. He showed his love for me and for all men and women. I was born on August 20, 1976, in Harrisburg, Pennsylvania, to James and Frances Haslam. I am the first of three boys, and after me come Daniel and Nicholas. My parents were both born in Pennsylvania. My father lived in Philadelphia and grew up sharing the Protestant faith of his parents. My mother lived in northern Pennsylvania. Her parents were faithful Byzantine Catholics. My parents met and then settled in Harrisburg, Pennsylvania. As a nurse, my mother learned to serve and assist the suffering through her daily work at hospitals. My father worked for the state government and was also in the military part time for many years. My brothers and I were born in Harrisburg and then baptized at St. Cyril and Methodius Parish, a Byzantine Catholic parish in Berwick, Pennsylvania. As a child, I liked sports, competitions, and my studies. In everything, my focus and joy was competition: to be the best, to win, and to get a good reputation. As a young boy without many friends and an introverted personality, I sought to get attention. I frequently played baseball and basketball, but my real passion was to study. I saw this as my main path to “get ahead” of the rest and be a success. Science, math, and history were my favorite subjects. I entered in a number of science competitions, in which we had to prepare a professional experiment and presentation of results. Several times, I won first prize and had the opportunity to compete at the state level. I finished high school second in my class in 1994, with many honors and with prospects for a fabulous future. I studied electrical engineering at Rensselaer Polytechnic Institute in Troy, New York. During these years, I fell into many bad habits, and the successes were never enough to satisfy me. God, however, helped me to avoid wandering too far, by my involvement in a Catholic youth group on campus. Upon graduating from college in 1997, I achieved my dream of receiving the highest paying position among the graduating class. Despite this, my life was very sad and empty, because money and honors can never satisfy our heart. travel the world. God had other plans! I had everything when I was at Xerox: money, a nice car (I was in the process of buying a new BMW 5-series), prospects for a wonderful wife, good friends, a luxury apartment; in a word, a bright and successful future. Everything seemed secure, and it seemed just a matter of time. I had all that society said was success. In the midst of this lifestyle, I only went to Mass on Sundays, and I went eight years without going to the Sacrament of Confession. Looking back at my life during this period, I truly believed and lived as an atheist. In this confusion, I began studying all the world’s religions looking for light. In the middle of this situation, God took action. My conversion began one normal day. As I woke up for work at 6:30 A.M., I immediately received a strong conviction that my life was empty and in danger of complete failure. I was living my life only for material things, satisfactions, and pleasures. Life was a party and game for me. In this moment, I realized the truth of life: the message of Jesus Christ risen from the dead, as well as the reality of eternal life, including the Final Judgment when we must all give an accounting for our actions. I did not understand this experience, but things began to change little by little. I began to read the Gospels each day, I prayed the Rosary, and I finally made a truthful, sincere, and thorough confession after eight years. This confession was a turning point in my life. As soon as I received absolution, I was filled with an overwhelming interior joy and peace. From this moment forward, God freed me from many of the bad habits I had acquired. What I previously could not escape and avoid, I now lived with the power of the risen Christ, who helped me live a life of virtue, a life consistent with his, whereby I could find my true happiness and fulfillment. Finally, I had a personal encounter with Jesus Christ during Eucharistic adoration. With this experience, Jesus Christ began to be my best friend, and I sought only to love and serve him. After the confession and experience in the Eucharist, which took place in 1998, God moved quickly. “My plan” changed to “his plan” for my life. I was approached on three separate occasions and by three distinct persons about a vocation to the priesthood. The first time, it occurred while I was with a youth group in my parish. One of the members asked if I had ever thought of being a priest. I could not bear the suggestion, and so I ran out before giving him a further chance to speak. The second time, it was during a retreat in Canada on Pentecost of 1998. I met a woman in the food line who asked me if I was a seminarian. When I told her “no,” she told me, “You will be!” and touched me with her finger to emphasize her prediction. I could not believe that I could be a priest. I did not want to be a priest, and I certainly did not understand what it really meant to be a priest. When at last a friend from college asked me about the priesthood, I began thinking that it might be God’s will for my life. Over the course of many days and weeks of searching and interior darkness, I prayed often and also received good advice from a diocesan priest, Fr Vincent McMahon, at Holy Spirit Parish. One day, I asked the Lord how I could best serve him, since the needs of the world and Church were so great. His response was loud and clear: “The best thing you can do is be a holy priest.” With the conviction of the call being so clear, I began to investigate where I should go. I had never heard of the Legionaries of Christ or Regnum Christi. My first thought and desire was to be a diocesan priest. I visited four dioceses, but I felt that God did not want this. I also interviewed with the Jesuits, the Dominicans, the Franciscans, and the Maryknoll Missionaries. In each case, God helped me understand that these were not the paths he was asking me. It was a very difficult period in my vocation, because I was finally open to the priesthood, but I was unsure of the path forward. After this, a friend told me about the Legionaries of Christ, saying, “They are a group that loves Jesus Christ, have Eucharistic adoration, love Mary and the Church, defend the pope, and help the poor (both those who are spiritually poor and the materially poor).” When I heard about their discernment retreats, I went to visit the seminary in Cheshire, Connecticut. At first, I did not want to enter, but the example of prayer, joy, and desire to help the world that was dying for lack of Christ made a big impact on me. I could not believe my eyes as I saw 130 young people, all happy and dressed in cassocks. The experience certainly made me think about the possibility of entering one day. Over the next five months, I forgot my experience in Cheshire. I focused on my work at Xerox and girls. Each time a thought came to me about the priestly vocation, I asked God for a definitive sign. God helped me through several friends, who asked me periodically about entering the seminary. The definitive moment arrived one night when a Legionary visited Auburn, New York, and asked to meet me for dinner. He invited me to the summer discernment program in Cheshire. After the dinner, I went to the adoration chapel near my home and put everything in Jesus’ hands, saying, “You gave me everything, and you love me more than anyone else. All my life I lived for myself, but now it is time that I live for you and your plan. I do not know what this priestly mission entails, but I am going to follow your call. Help me to be generous and to fulfill your will for my life.” I immediately experienced a great joy and peace. Never was I happier during my life than in the moment I made the decision to follow Christ with my whole life as a priest. During the following two months, I left my job at Xerox and went to Lourdes to thank Mary for my priestly vocation. I realized in these months that true success in life is to follow and be faithful to the plan of God. I entered the Legionaries of Christ with 45 other young men in June, 1999. My training in the Legionaries has been 11 years full of graces. More than anything, I learned that Jesus Christ is our best friend. His love and his friendship invite us to be generous, and to let him make our own hearts more like his: good, meek, humble, tactful in speech and thought, and ready to help those around us. 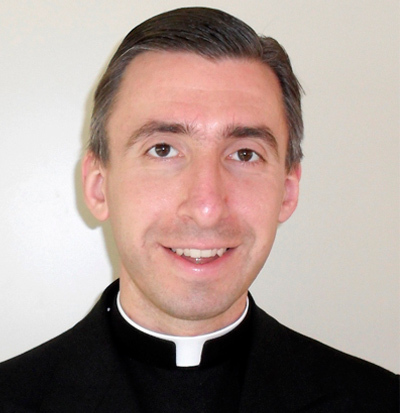 Fr Nathaniel Haslam, L.C., was born in Harrisburg, Pennsylvania, on August 20, 1976. He attended St. Margaret Mary elementary school, Harrisburg High School, and Rensselaer Polytechnic Institute, with a major in electrical engineering and a minor in mechanical engineering. He entered the novitiate of the Legionaries of Christ on September 15, 1999, in Cheshire, Connecticut, but spent his two years of novitiate in Dublin, Ireland for two years. He studied philosophy in New York and theology at the Pontifical Regina Apostolorum College in Rome. In between, he helped with youth and retreat work in the northeast United States. Since the summer of 2010, he has been the director of the International Leadership Semester program, and he continues his studies in theology and bioethics.